ATP synthesis of Mycobacterium tuberculosis by inhibiting the activity of proton pump on the cell’s ATP synthetase, and thereby eliminates M. tuberculosis (TB). It’s used for adult multi-drug resistant tuberculosis (MDR-PTB). Bedaquinoline has the same bactericidal activity against both sensitive and resistant strains of mycobacterium tuberculosis as well as on dormant bacteria. The proton pump on the cell’s ATP synthetase, which is a crucial enzyme for M. tuberculosis (TB) to synthesize ATP, is the unique and specific locus of Bedaquinoline. After the combination onto the oligomer and lipoprotein subunit c, Bedaquinoline can inhibit the synthesis of ATP and bring the death to the bacterium cell. Compared with those existing anti-TB medicines, it presents a novel pharmacology and no cross resistance effect was found between Bedaquinoline and other anti-TB medicines. The gene sequence of the subunit c of ATP synthetase is named as atpE, whose amino acid sequence is highly conservative. The resistance of TB to Bedaquinoline comes from its reduced combination onto subunit c of ATP synthetase due to the mutation of the 63rd or 66th on atpE. Bedaquinoline is easy for oral assimilation. The bioavailability of Bedaquinoline taken with food is twice higher than when taken with an empty stomach. It reaches its blood concentration in 5 hours after taken and has a plasma protein binding rate of 99.9% as well as a plasma half-life of 173 hours. Bedaquinoline can be widely distributed in human body with a homeostasis distribution volume of 1000Ｌ. Its clearance rate is low enough and the elimination half-life is 5.5 months. Bedaquinoline is metabolize into metabolite 1~8 in the demethylation mainly through CYP3A4 and partly though CYP2C8 and CYP2C19. Metabolite 2 （M2）, the most important metabolite, which has only 1/3-1/6 the activity of Bedaquinoline, yet present a more strong cytotoxicity and is more likely to cause the drug-induced phospholipidosis. Bedaquinoline and its metabolites are mostly excreted by feces, only 1% to 4% by urine. Common adverse reactions are nausea, headache, arthralgia, loss of appetite, vomiting and rash, dizziness, elevated transaminase, increased hemodiastase, muscle pain, diarrhea and prolonged TQ interval. 3.Pregnant women, lactating women, children, the old and co-infected HIV sufferers (relative contraindication). In December 2012, the US FDA approved bedaquiline as part of combination therapy for the treatment of multi-drug resistant tuberculosis (MDRTB). Bedaquiline is the first drug approved for MDR-TB and is the first approval from a new class of antituberculosis agents in the past 40 years. Due to the high unmetmedical need for treating MDR-TB, the FDA granted bedaquiline accelerated approval based on Phase II results, providing patients access to the drug while additional clinical studies are carried out. Bedaquiline (also known as TMC207 and R207910) is a diarylquinoline that was discovered from a high-throughput, whole-cell screening strategy with Mycobacterium smegmatis used as a surrogate for M. tuberculosis. Bedaquiline is a single enantiomer of an initial screening hit. 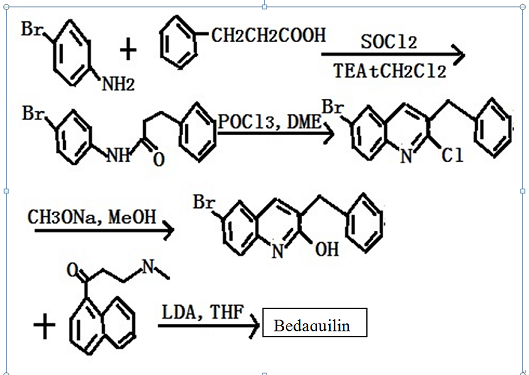 Bedaquiline has potent and selective activity against mycobacteria, and is active against both drug-sensitive and drug-resistant M. tuberculosis. The mechanism of action of bedaquiline is unique amongst anti-TB drugs and involves inhibition of mycobacterial ATP synthase; it is not active against human ATP synthase. Bedaquiline has in vivo activity in numerous preclinical models of TB infection, alone and in combination with other anti-TB agents, and has bactericidal activity in established TB infection models. Bedaquiline is synthesized in five steps from 3-phenylpropionic acid and para-bromoaniline. Following amide formation, treatment with POCl3 and DMF under Vilsmeier–Hack conditions gave a 2-chloroquinoline product. Treatment with sodium methoxide, followed by condensation with 3-(dimethylamino)-1-(naphthalen-1-yl)propan-1-one, and separation of isomers gave bedaquiline. (αS,βR)-Bedaquiline is a diarylquinoline derivative that acts as a mycobacterial inhibitor. Bedaquiline shows promise as potential drug in the treatment of tuberculosis. Labeled Bedaquiline, intended for use as an internal standard for the quantification of Bedaquiline by GC- or LC-mass spectrometry. 843663-66-1 US $10.00 / KG 10UG 99% 500kg/month Hebei Chisure Biotechnology Co., Ltd.